Asia Bibi is a Pakistani woman, recently released from death row in Pakistan. Her crime? She was overheard saying something negative about The Prophet Mohammed. Who heard her say these things? It doesn’t matter. They said they heard them and then whipped up a public frenzy by throwing blood in the water in the form of other accusations, signaling the sharks. In response, the sharks circled Ms. Bibi in an anti-human, anti-free speech, anti-Christian feeding frenzy. The Pakistani government then sentenced Ms. Bibi to death for the crime of blasphemy and other verbal atrocities. That was her real crime, she was a Christian living in an overwhelmingly Muslim culture. Ms. Bibi’s crime, apparently, was as manufactured as the numerous false accusations made against Judge Brett Kavanaugh just a few short weeks ago in the U.S... Those too were based solely on hearsay and sustained by religious zealots. Which is the problem of zealots, you can’t reason with them. The fact that they’re secular zealots doesn’t matter a damned bit. A zealot is a zealot, regardless of their reasons, since reason is seldom ever involved. Thankfully, we have a Constitution and a Bill of Rights in the U.S., unlike Pakistan. Unlike England, as well. If you ever wondered why the idea of the Constitution as a "Living Document" is so problematic, there it is. Without a fixed meaning, the Constitution and the Bill of Rights are just nice suggestions. An open-ended set of rules as malleable as putty—meaning whatever politicians and judges say they mean. Fearing for her life, Ms. Bibi sought Asylum in the UK, which is home to a large Muslim/Pakistani population. 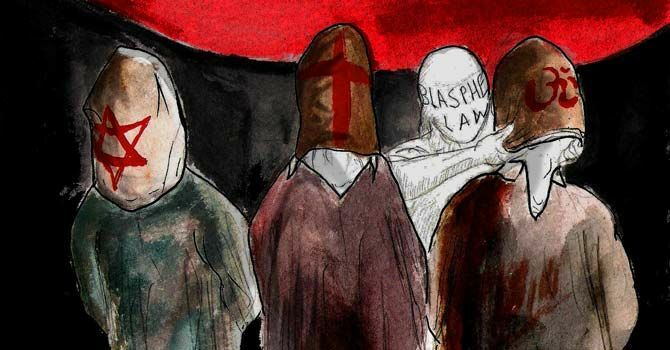 Politicians in The UK responded by saying that Ms. Bibi’s presence could be “Disruptive.” People might be offended by a blasphemer living in their midst, even if there was no evidence that she actually blasphemed. So the UK denied her entrance. “Who needs possible blasphemers. This could cause problems among the natives?” the UK elites seemed to be saying. We're talking about Christian England, here, not Pakistan or Iran, leaving Ms. Bibi adrift in a hostile, anti-human, anti-Christian culture, ruled by corruption and zealotry. I mean Pakistan, not England. But, with a ruling elite in The UK, wedded to the ruling oligarchs in The European Union, England’s transformation into a more kindly form of totalitarianism is happening at an amazing pace, and mass immigration from predominately Muslim countries is helping to drive it. That is why Ms. Bibi can’t migrate to once Christian England. So much for the myth that immigration is about helping poor helpless people. That is, in most cases, a nakedly treacherous lie, framed by benevolent sounding language. Here is the real reason: Europe needs cheap labor. Their aging populations and significant welfare states have to be paid for by someone, even if those newly arriving someones take advantage of the welfare state just like the indigenous population does, creating a very circular problem. That is the nature of politics. Short term gain for politicians, means potential long-term suffering for people. You can’t very well fix your society’s problems unless you get elected, which is the mantra of every politician. They also need to keep raising money so they can stay elected. That is their second mantra, with the second, inevitably subverting the first. As the result, society erodes in barely visible increments until society no longer exists. At least, not as it once did. That isn’t bigotry. It’s self-preservation.